Super-Writemaster USB BUS power only. 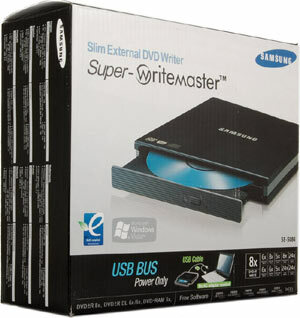 8X DVD-/+ write, 24X CDRW, 24X CDROM, 8X DVD Reader. Tray Loading Drive for easy access to media even when the drive is turned off. No need to power the drive on to remove your discs. Nero Software Suite (NERO Burning ROM, NERO Showtime, PowerDVD) included.